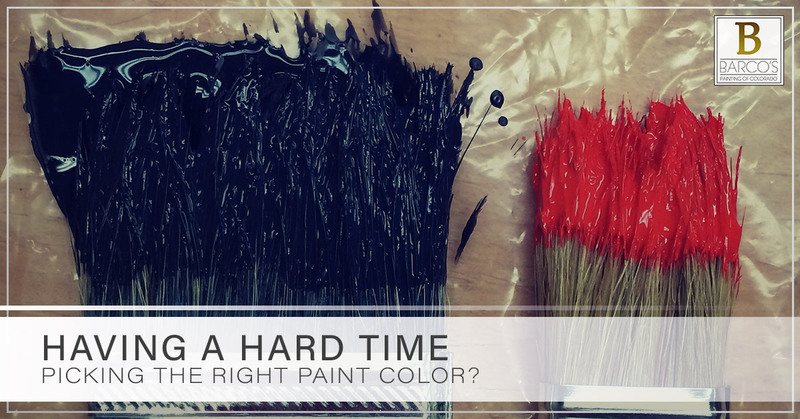 Having a Hard Time Picking the Right Paint Color? There’s nothing worse than having a vision for a room, picking out a paint color, painting the walls…and then hating the end result. Many people have been there before. Whether you got your inspiration from a home decor magazine or the idea simply popped into your head it can be an exciting prospect when you have made the decision to make some changes around your home. Fortunately for you if you have gotten some inspiration but you want to be certain that you’re heading in the right direction, Barco’s is the Castle Rock painting company you can count on to steer you in the right direction. We proudly offer a free color consultation, and in today’s post we’ll highlight a few tips to get the process started off on the right food. Keep reading to learn more! Yes, we just mentioned that sometimes inspiration can lead you astray, but our advice is to really look at a photo of a room you like and figure out why it all works together. For example, a black room on an interior decorating website can look great, but it might be because that rooms also has a ton of natural light. If yours doesn’t it can start to feel like a dungeon. What mood do you want your room to evoke? Keep in mind that colors like blue and green often feel more relaxing whereas yellows, oranges, and reds can help you to feel energized. There’s an exception to every rule, of course, but knowing the mood you are going for in a room can go a long way towards helping you to get the color just right. We’ve talked about the Sherwin-Williams ColorSnap Color Visualizer before, but boy is it helpful! This amazing tool allows users to upload photos of their projects to change up colors. In other words, it’s like painting a room without having to actually paint a room. This is perfect for considering your options, narrowing your choices down, or realizing that you just outright dislike something you thought you might enjoy. As the go-to painting company in Castle Rock (and Parker, Highlands Ranch, Lone Tree, Littleton, and the surrounding area), Barco’s Painting of Colorado has a goal of ensuring that our clients absolutely love the new paint color in their homes. That’s why whether it’s exterior painting to get your home ready to sell or interior painting for a total remodel our team of professional painters is here to lend a helping hand. We believe that how people feel about their living spaces makes all the difference in the world. Your home is the place you go for rest and relaxation so you might as well enjoy being there, right? Contact us today to get a free quote and ask about a free color consultation from our team of experts. We’ll be there to make sure your project is headed in the right direction!